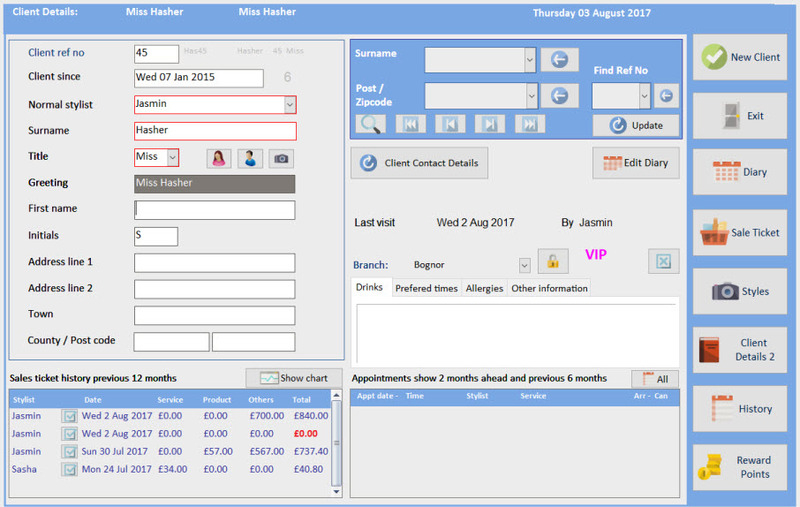 The Client Details screen records all the information about your individual clients. It gives your staff quick and easy access to the information they’ll need to make your clients feel at home – which is an essential part of running any successful and profitable business. The client’s usual stylist is recorded here, along with details of their last visit including the date, and which member of staff took care of them. Information about your client’s appointment history can be accessed from this screen as well as other useful information such as your client’s preferred appointment times, or any allergies they may have to certain products. You can even record whether they prefer coffee with sugar, or tea without. Clients can be searched for by surname, postal code, or reference number - and any Client can be found within five seconds …so the next time they phone the salon, all their details are on-screen and ready to hand.